Our last day in Liverpool we visited the Cathedral Church of Christ in Liverpool. 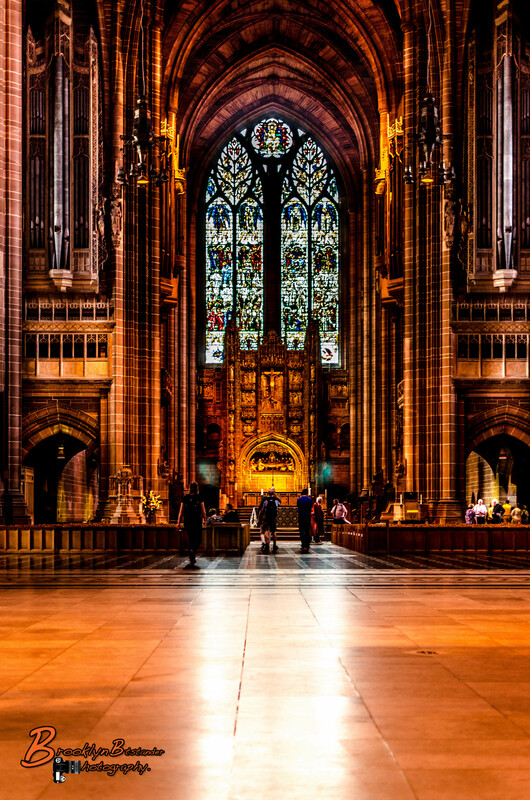 Liverpool Cathedral is the Church of England Cathedral of the Diocese of Liverpool, built on St James’s Mount in Liverpool and is the seat of theBishop of Liverpool. Its official name is the Cathedral Church of Christ in Liverpool but it is dedicated to Christ and the Blessed Virgin. The total external length of the building, including the Lady Chapel, is 207 yards (189 m) making it the second longest cathedral in the world; its internal length is 160 yards (150 m). 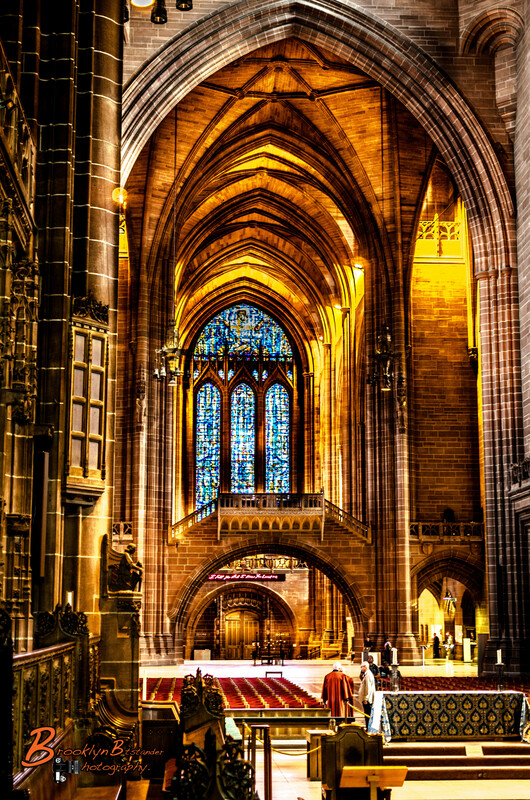 In terms of overall volume, Liverpool Cathedral ranks as the fifth-largest cathedral in the world and contests the title of largest Anglican church building alongside the incomplete Cathedral of Saint John the Divine in New York City. With a height of 331 feet (101 m) it is also one of the world’s tallest non-spired church buildings and the third-tallest structure in the city of Liverpool. The cathedral has been designated byEnglish Heritage as a Grade I listed building. The Anglican Cathedral is one of two in the city. The other, the Roman Catholic Metropolitan Cathedral of Liverpool, is situated approximately half a mile to the north. The Cathedrals are linked by Hope Street, which takes its name from William Hope, a local merchant whose house stood on the site now occupied by the Philharmonic Hall, and was named long before either Cathedral was built. 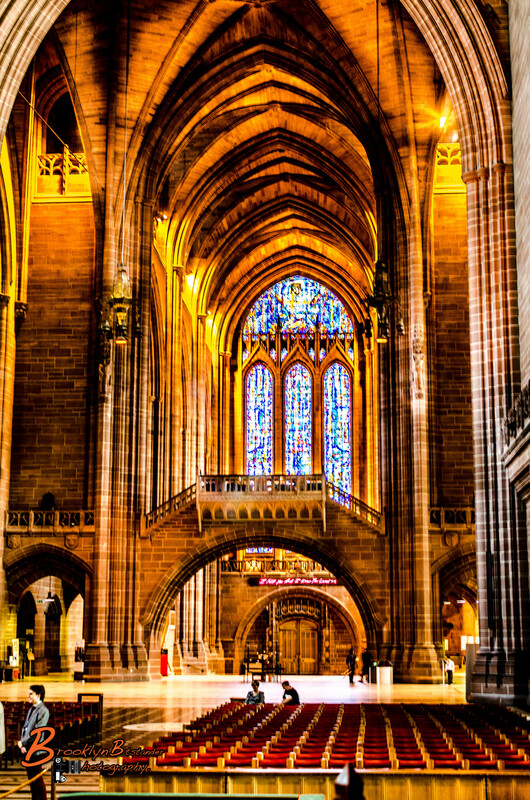 This entry was posted in Photography and tagged architecture, Cathedral, colour, digital, Holiday, Lightroom, Liverpool, Photography. Bookmark the permalink. Mike, thank you so much for taking us on this journey with you! It is absolutely beautiful. Thank you, it is hard to explain how amazing it was. Absolutely beautiful shots…incredible lighting, and you did an amazing job capturing the whole scene (very emotional shots). Well done. I’m thrilled that you visited the Anglican Cathedral, I feel so small when standing in the nave, thank you Mike. I think you need to be featured on WP ! Wow that would be great Maybe one day !!! Mike you caught “grandness” perfectly! Beautiful photos, Mike. Thanks for sharing.